Charles Dickens' A Christmas Carol made its first appearance in 1843, at a time when many social critics feared the old holiday traditions were dying out. This darkly comic tale tells the story of the penny-pinching banker, Ebenezer Scrooge, who believes Christmas to be little more than a handout for the poor. Over the course of Christmas Eve, Scrooge is visited by the ghosts of Christmas past, present, and future, who remind him of what his life was like before bitterness set in and what it will surely become if he fails to mend his miserly ways. A joyous affirmation of goodwill and the value of the human spirit, it was an immediate success and has been an integral part of Christmas celebrations ever since. 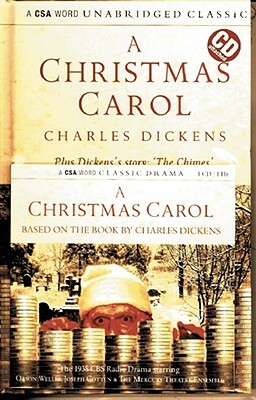 Following its success, Dickens wrote four Christmas stories, including "The Chimes," featured here, a hard-hitting but witty satire that deflates commonly held views about society's poorest members. Charles Dickens (1812-1870) is considered one of the English language's greatest writers. His works include The Adventures of Oliver Twist, David Copperfield, Great Expectations, The Life and Adventures of Nicholas Nickleby, and A Tale of Two Cities.